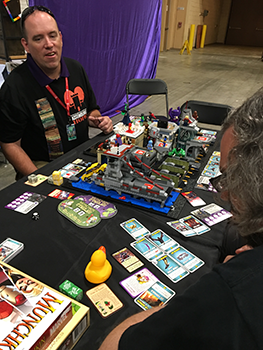 Another glorious Munchkin battle in the name of charity occurred at Brickworld 2017 in Chicago! 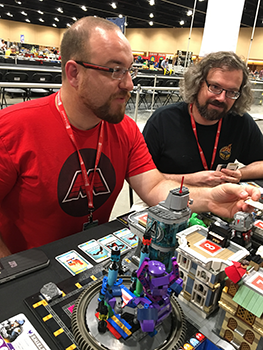 Fighting it out on the newly revealed Munchkin: Marvel Edition brick-built game board, four brave souls battled it out on the rooftops of the city versus our Events Director, Guy Himber, in a head-to-head contest to see who could be the most munchkin-y. After an extended adventure, Guy took a strong lead due to his skillful ripping of the infamous Deadpool's Taco Truck card, which gave him two levels and led to selling off ALL of his active cards to buy even more levels . . . leaving himself with almost nothing on the game table. This confounded his fellow players, who cast more perplexed stares as he played a Trap on himself! Much to the amusement of everyone, the Trap forced Guy to trade his now-empty pool of cards with the player to his right (sorry, Reed! ), who happened to have the strongest combat strength at the table. Now positioned to strike for the win, Guy flipped a monster on the Door draw and prepared to have everything including the kitchen sink thrown at him. But as the many sinks were being tossed, a strange - yet extremely munchkin-y - thing happened . . . two of his opponents began to help him for the win! To reward their kindness, Guy split his victor's loot among his two favorite munchkins. 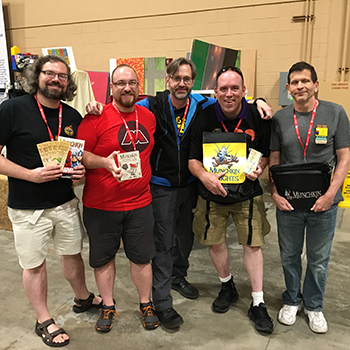 Big thanks to Joel, Reed, Peter, and Alex for helping us raise $1,300 in this year's charity auction! Editor's note: Guy's company, Crazy Bricks, has a Kickstarter going on right now for Pugs & Pizza, character accessories for your minifigs. It's almost over, so check it out and support if you can!